Close-up tasks like drawing, painting, jewelry-making, and crafting are easier using the full-spectrum light produced by these energy-saving magnifying lamps from Naturalight. 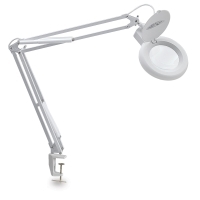 With a slim head design that offers an improved viewing area, the lamps have high-quality lenses that magnify up to 1.75X, making them ideal for detailed work. The arm measures 38½" when fully extended. Both models include a tube and table clamp; the 5" model also features a lens cover. Energy-saving Daylight tubes provide loads of light, but use 80% less energy and last 10 times longer than incandescent tubes. The full-spectrum light they produce reduces glare and eye-strain, and facilitates accurate color-matching. Naturalight lamps also incorporate natural materials wherever possible, and are made to the strictest environmentally friendly production standards. 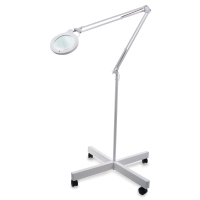 LED Magnifying Lamp with 5" Lens and Wheelbase — Same modern, slim design but with the power of LED lighting. It's the perfect lamp for detailed, close-up work. The LEDs are dimmable, with two brightness settings, and the 5"Dia glass lens provides 1.75X magnification. The adjustable arm reaches up to 44" and can be moved easily with one hand. Effortlessly position the shade exactly where you need it. The included floor stand rolls on four lockable wheels. The LEDs have a color temperature of 6,500K. 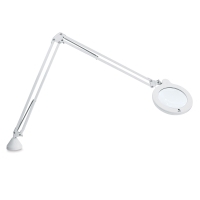 LED Magnifying Lamp with 5" Lens — Same modern, slim design but with the power of LED lighting. It's the perfect lamp for detailed, close-up work. The LEDs are dimmable, with two brightness settings, and the 5"Dia glass lens provides 1.75X magnification. The adjustable arm reaches up to 44" and can be moved easily with one hand. Effortlessly position the shade exactly where you need it. The LEDs have a color temperature of 6,500K. Color Temperature — Consider the color temperature of any artificial lighting source you use in your studio, or for viewing and displaying artwork. Color temperature is a characteristic of visible light, and is usually measured in degrees Kelvin (K). A higher color temperature (5000K–6000K) appears more bluish and cool, while a lower color temperature (3000K–4000K) appears more reddish and warm. The color temperature of natural sunlight varies throughout the day, and with weather conditions. It is lower at dawn and sunset, but reaches a peak of about 5500K around midday. Most “natural daylight” products are designed to emit light at around 5200K–5300K, typical of mid-morning sunlight on a bright day. ™ Daylight is a trademark.™ Naturalight and Think green, think Naturalight are trademarks. Daylight Naturalight lamps have been designed to do their bit to protect the planet! All Naturalight packaging is 100% cardboard — so you can do your bit, too, and recycle it! We know in today's economy consumers are looking for a value. Naturalight by Daylight gives the beginner, the student or anyone looking for a full spectrum light source, that option. All Naturalight lamps feature energy saving tubes and bulbs that use up to 80% less energy than traditional light bulbs.